“Ruth was my life partner, and we were called by God as a team,” Mr. Graham said of his life-long marriage and ministry partner. “No one else could have borne the load that she carried. She was a vital and integral part of our ministry, and my work through the years would have been impossible without her encouragement and support. “I am so grateful to the Lord that He gave me Ruth, and especially for these last few years we’ve had in the mountains together,” Mr. Graham continued. “We’ve rekindled the romance of our youth, and my love for her continued to grow deeper every day. I will miss her terribly, and look forward even more to the day I can join her in Heaven.” Mr. Graham confirmed today that his wife’s final resting place will be at the foot of a cross-shaped walkway in the Prayer Garden on the grounds of the recently dedicated Library bearing his name adjacent to his ministry headquarters in Charlotte. Earlier this year the Grahams agreed together that they would be buried side-by-side at the Library, a decision made by the two of them alone. Ruth Bell was born June 10, 1920, in Qingjiang, Kiangsu, China, the daughter of medical missionaries L. Nelson and Virginia Leftwich Bell. She attended high school in Pyongyang, (now North) Korea. She first came to the United States at the age of seven, while her parents were on furlough. She returned to the United States at the age of 17 to attend Wheaton College in Wheaton, Ill. Shortly after his arrival on campus, she was introduced to “Preacher,” the nickname other students gave the strapping Billy Graham from Charlotte, North Carolina. They were married in August 1943, following their graduating together that June. Between 1945 and 1958, Mrs. Graham gave birth to five children, whom she raised—sometimes single-handedly—while her husband was away on extended national and international evangelistic crusades. The three daughters and two sons who survive her are all actively involved in ministry, including eldest son Franklin, who heads the Billy Graham Evangelistic Association (BGEA) founded by his father. “My father would not have been what he is today if it wasn’t for my mother,” Franklin said. “She stood strong for what was biblically correct and accurate. She would help my father prepare his messages, listening with an attentive ear, and if she saw something that wasn’t right or heard something that she felt wasn’t as strong as it could be, she was a voice to strengthen this or eliminate that. Every person needs that kind of input in their life, and she was that to my father.” In 1959, Mrs. Graham published her first book, Our Christmas Story, an illustrated volume for children. She went on to write or co-author 13 other books, many of them works of poetry she wrote as an emotional release while her husband was so often on the road through the years. “I don’t believe Mother has adequately been recognized and honored for what she had done; because, without her, Daddy’s ministry would not have been possible,” said Ruth Graham, youngest daughter—and namesake—regarding her mother’s influence and partnership in her father’s ministry. “How does one live with one of the world’s most famous men?” daughter Ruth continued. “God began training my mother for this position years ago in China. Her parents exercised a profound effect upon the development of her character, and laid the foundations for who she was. What she witnessed in her family home, she practiced for herself—dependence on God in every circumstance, love for His Word, concern for others above self, and an indomitable spirit displayed with a smile. “Her happiness and fulfillment did not depend on her circumstances,” the younger Ruth concluded. “She was a lovely, beautiful, and wise woman, because early in life she made Christ her home, her purpose, her center, her confidant, and her vision.” Mrs. Graham’s significant role in Mr. Graham’s ministry was recognized in 1996, when they were jointly awarded the Congressional Gold Medal in a special ceremony in the Capital Rotunda in Washington, which reflected a consensus of love and support from all branches of government in attendance. 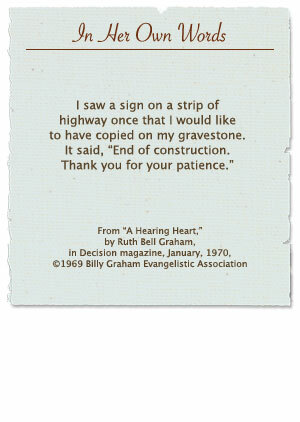 Ruth Graham was always a vital part of Mr. Graham’s evangelistic career, and he turned to her for advice and input about many ministry decisions. One of the early uses of media by the BGEA was the “Hour of Decision” radio program begun in 1950, which she named. After her upbringing in China and high school experience in Korea, she continued to have a burden for the people of Asia. She encouraged her husband to visit and later accompanied him during his historic visits to the People’s Republic of China. Ruth Graham has been in frail health since suffering spinal meningitis in 1995. That was exacerbated by a degenerative back condition that began with a fall out of a tree while helping a grandchild fix a swing in 1974 that resulted in chronic back pain for many years. Bedridden or wheelchair-bound since the late 1990s, Mrs. Graham wasn’t able to accompany her husband during his last few years of ministry, but was always a continued source of inspiration and support for him through her prayers and wise biblical counsel. Mrs. Graham is survived by her husband Billy; daughters Virginia, Anne Morrow, and Ruth Bell; sons William Franklin, III, and Nelson Edman; 19 grandchildren; and numerous great-grandchildren.